The Bible tells us, in Acts 4:36, of a man named Joseph who was renamed by the apostles. Thus Joseph, who was called by the apostles Barnabas (which means son of encouragement . . . Son of Encouragement – what a nickname! This verse goes on to tell us that Barnabas sold a piece of land and gave all the money to the apostles to help needy in the church. The next time we hear of Barnabas is in Acts 9:27 when he was willing to defend a new convert named Saul (the persecutor of Christians). In Acts 11, he is sent to Antioch to encourage the Christians. There he brought Saul and the two spent a year in Antioch preaching the gospel and building up the church. In Acts 11:29-30 Barnabas and Saul are asked to take relief funds to Judea to aid with the famine. Acts 13 finds Barnabas setting out on a missionary journey with Saul. Acts 15 shows us Barnabas encouraging the young man John Mark who had once deserted him. Where would we be without the encouragement provided by Barnabas? Without the moneys he provided to the church in Judea many would have starved. Without his encouragement of Saul – who became the apostle Paul – most of the churches of Asia would have never existed and we would be missing over half of the New Testament. Without his encouragement of John Mark, we would be missing one of the gospels and Paul would have been without help in Rome (II Timothy 4:11). A little encouragement certainly goes a long way! But what does this have to do with women today – nearly 2000 years after Joseph was nicknamed “Son of Encouragement”? It reminds us that little acts of encouragement can have a BIG impact. I doubt that Barnabas realized how important Saul would be to the spread of the gospel when he presented Saul to the apostles in Jerusalem. We may never know what great things that person whom you encourage may go on to do. So don’t forget to offer a kind word to the difficult co-worker; leave a nice tip for the struggling; single mother who serves at your favorite restaurant; give a smile and patience to the stressed-out cashier at the grocery store; spend a little time with that elderly neighbor or offer help to the young mother with the crying child. You never know what the consequences may be. Imagine what the world would be like if we were all “Daughters of Encouragement”! Shall we give it a try?!? you have an apparent contradiction. How can you make the ark with a length of 300 cubits and also make the ark with a length of 2.5 cubits. And how can you make the ark of gopher wood and at the same time make it of shittim wood. So obviously the Bible is lying to us, right?? You probably realize that the two Bible passages are, in fact, talking about two entirely different arks – in Genesis 16, God is giving Noah the plans for the ark that would save his family from the flood but in Exodus 25, God is giving Moses directions for the ark of the covenant or the ark of testimony that was to be placed in the tabernacle. The reason these two verses seem to contradict is simply that they are talking about two totally different things. Sometimes, we have to use a little bit of reasoning to understand all of what the Bible is telling us. So in the example above, if we take the words at face value we would obviously have a contradiction, you can’t make something entirely out of gopher wood and entirely out of shittim wood and you can’t make something 300 cubits long and 2.5 cubits long at the same time. Only by reading the context of the verses, do we realize that there isn’t a contradiction at all. Just a misunderstanding of God’s word. Other times in Bible study, we have to put together all the facts from more than one location in the Bible to fully understand what God is telling us. As an example, let’s look at the night that Jesus was betrayed. we learn that after they seized Jesus someone took a sword and cut off the ear of the servant of the high priest. we learn that it was one of Jesus’ disciples who drew his own sword and cut off the ear of a servant of the high priest. When they which were about him saw what would follow, they said unto him, Lord, shall we smite with the sword? we learn that the servant of the high priest lost his right ear and we also learn that Jesus healed the servant of the high priest. Then asked he them again, Whom seek ye? And they said, Jesus of Nazareth. That the saying might be fulfilled, which he spake, Of them which thou gavest me have I lost none. Then Simon Peter having a sword drew it, and smote the high priest’s servant, and cut off his right ear. The servant’s name was Malchus. we discover that it was Simon Peter who cut off the ear of Malchus, the servant of the high priest. So when you combine the four gospel accounts, you realize that on the night that Jesus was betrayed Simon Peter drew his own sword and cut off the right ear of Malchus, a servant of the high priest and that Jesus immediately healed Malchus and rebuked Peter for his rash action. So if you take any one of these four accounts in isolation, you do not get all of the details of the story. You might even be lead to believe that these accounts are contradictory when in truth they are sharing different details of the same event. The same is true for all of our Bible study. We must remember to look at everything the Bible says about a given subject rather than looking at one or two verses in isolation. We must remember to be like Paul Harvey and find “The Rest of the Story” to fully understand God’s word. I recently received an email containing the quoted lyrics of the hymn “A Mighty Fortress is Our God” by Martin Luther. This song never fails to remind me of something told to me by my college friend, Duncan. Duncan was taking Spanish classes and was reading Spanish texts for translation into English. One of the things he translated was some verses from Santa Biblia, the Spanish version of the Bible. He told me that Philippians 4:13 which reads “I can do all things through Christ which strengtheneth me” in the King James version, translates from Spanish into English as “I can do all things through Christ who is my fortress.” I didn’t know enough Spanish at the time to know whether this was an accurate translation but this rendering of Philippians 4:13 has always stuck with me. Christ who is my fortress. The word “fortress” brings to mind the medieval stone castles perched on hilltops all over Europe. These massive and ancient structures with their high, thick rock walls and imposing watch towers have withstood centuries of attack, foul weather, decay and the ravages of time. They were specially designed with the purpose of protecting those within its gates – of sheltering them from storms as well as enemy attack. The God of my rock; in him will I trust: he is my shield, and the horn of my salvation, my high tower, and my refuge, my saviour; thou savest me from violence. Repeatedly in this beautiful song, David refers to God as his Rock, his Shield, his Refuge, his defender. He eloquently praises God for the providential care that he has been receiving for so many years. 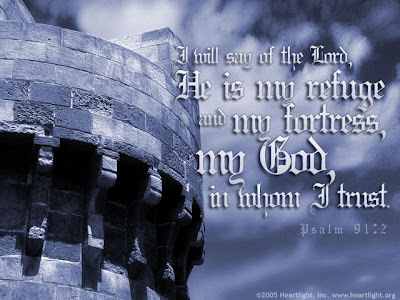 Whenever David was in danger from enemies, he knew that it was always God who was his rescuer, his savior, his refuge. In five of his Psalms, David echoes these battle terms in reference to God. In Psalm 18, Psalm 31, Psalm 71, Psalm 91, and Psalm 144, David calls God his rock, his fortress, his shield, his high tower, his refuge, his buckler and his strong habitation. David, who spent so much of his life in constant danger of death, always drew his strength and aid from God. This is a wonderful reminder to us as we face the battles and storms of life. We need to constantly turn for strength and aid to Christ who is our fortress. I have never forgotten that tiny pearl that Duncan shared with me although I haven’t seen him since he graduated from college more years ago that I care to admit and I remember very little else about him. Those simple words have helped me to weather numerous storms in my own life. I have also had many opportunities to share this little gem with others who were facing their own struggles. Duncan probably never knew what a wonderful treasure he gave with me on that ordinary day so many years ago but I will never forget him because of it. Wherever you are Duncan, thank you for a most precious gift. I can all things through Christ who is my fortress.